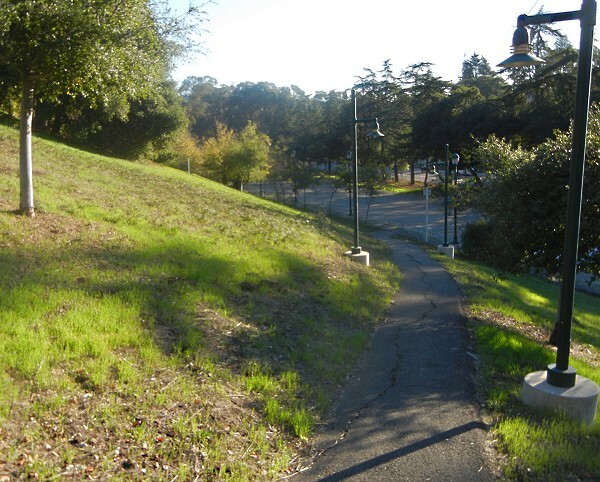 The big alluvial fan of old Pleistocene gravel making up Oakland’s most unusual topographic featurethe Fanis cut by stream erosion into eight lobes, which I’ve numbered from west to east. 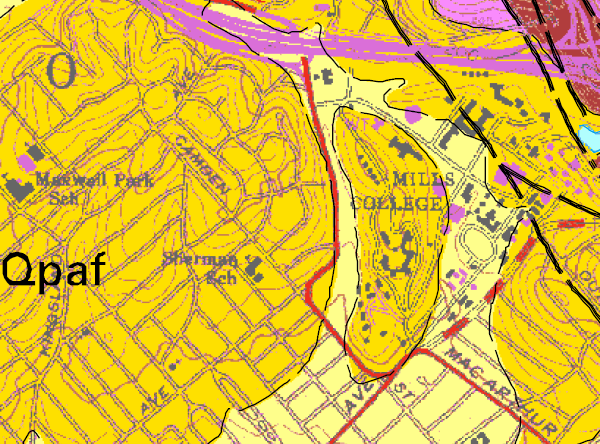 Lobe 7 is entirely inside the grounds of Mills College, as shown here on the geologic map. Seminary Creek passes the west side and Lion Creek the east. These streams are responsible for carving the hill away from the rest of the Fan. Of all the bits of the Fan, only this hill and Pill Hill stand isolated from adjoining bedrock. I’m unaccountably fond of both. 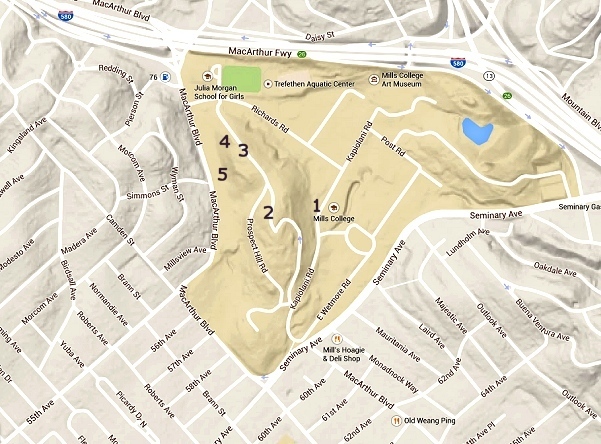 Here’s an impression of its topography from Google Maps. The numbers mark the locations of the photos that follow. 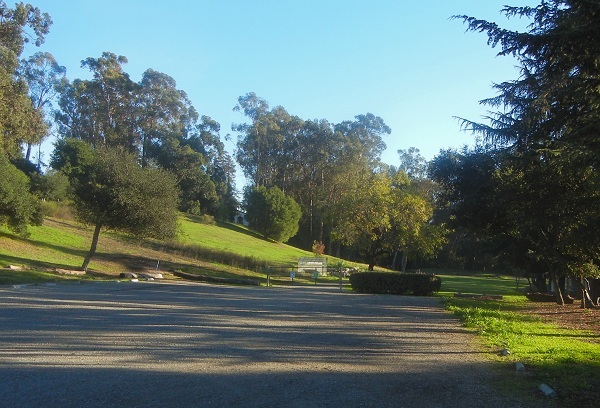 The hill is densely wooded, for the most part, which limits views of it and views from it. I’ve done what I can, but it’s hard to take in by eye. I have walked the hills and streets on all sides of this feature, and so far I haven’t found any spot where it stands out in a photo. You have to go there and walk it to get a sense of it. This walk goes clockwise around it. We start where Kapiolani Road is bumped off its straight line by the hill and a footpath takes you up its flank. As I said, most of the hill is wooded, but along the west flank there are spots with a view. 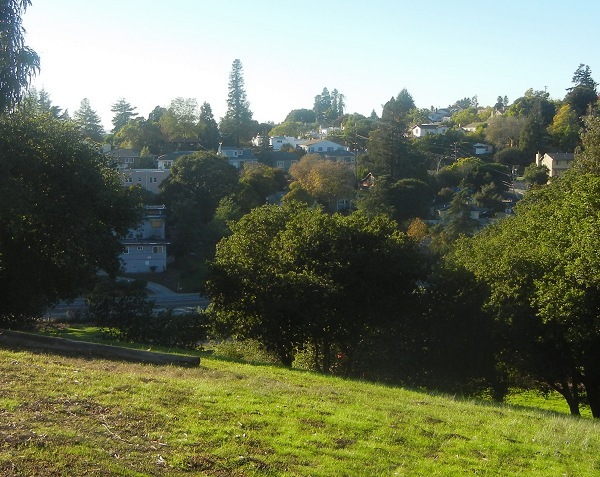 The next two photos look from the top of the hill over Seminary Creek’s valley (the creek is culverted here) toward the populated slopes of Maxwell Park hill, lobe 6. 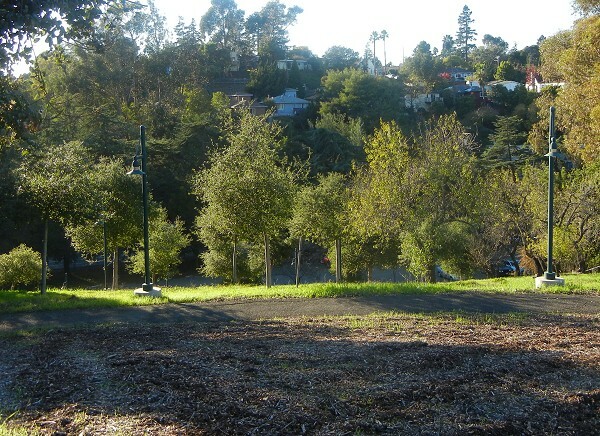 Near the north end of the hill is a footpath down the hill’s western slope to a little-used parking lot along MacArthur Boulevard. From there you can see a fair bit of the hillside. 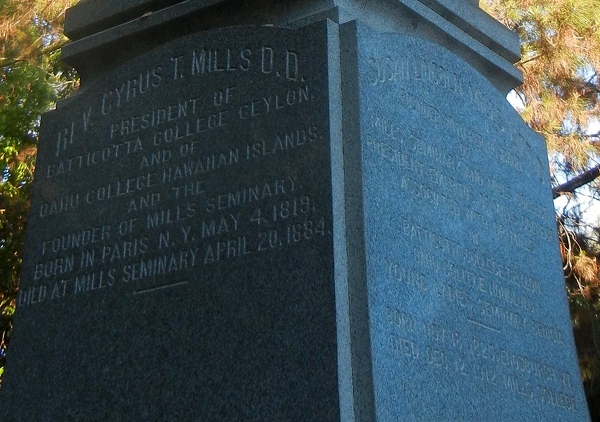 You can continue through the woods along Seminary Creek, then take the path past the little graveyard where the Millses, Cyrus and Susan, are buried. This entry was posted on 19 April 2015 at 4:12 pm and is filed under the Fan. You can follow any responses to this entry through the RSS 2.0 feed. You can skip to the end and leave a response. Pinging is currently not allowed. 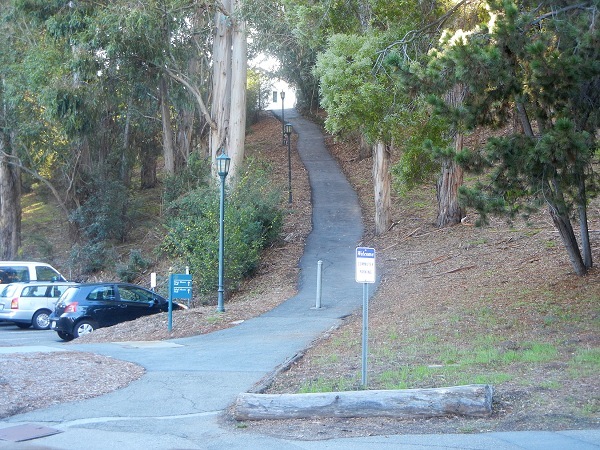 I’ve been on these paths at Mills and it never once occurred to me wonder how this hilly spot came to be. Shame on me. Once again, thanks for the education.